I'm guessing that the Walsall, England might refer to a distributor. :hiclp: Some Good reading there from GMB archives. :hiclp: I see I am not the only one wondering about this. Wonder IF any connection there at all ? Still seems strange that AltaGlass (in Alberta, Canada) would have the maker of the label (England) on the label. I am sure that there is a place in Canada that can do label. So this just seems a little strange. I mean on the label you are saying that it is Canadian Glass made in Alberta...then in Fine print (the label) is says England. Sorry Rose it is a loon. Attached are 4 photos , two penguins & two of a loon and or loon poster. Not that the penguin can't raise its wings above horizontal and they are distincst "batons" whereas the loon does raise it high and the feathers drape down in a curtain like fashion as in you lovely little weight. PS. I thought Robert Held is Candoan too - hence my attempt. That should say Robert Held is Canadian too!!!!! 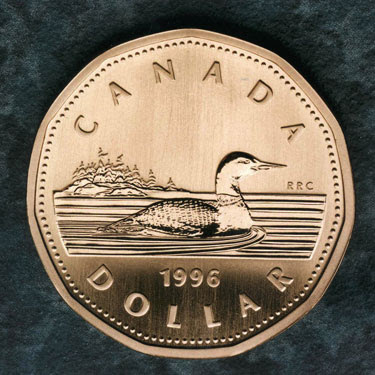 So everyday when I pull a dollar out of my wallet -- I face the loonie on our $1.00 coins here.....so the bleak of a loonie (as least here in Canada) are long. ....and Ross too was in the Right Country too with his guess of Robert held. Wallasy is in Cheshire, where my Father was born Rose. I was born in Liverpool, just across the Mersey River. Is it worth looking to see if there is/was a printing works there that made labels for other countries. As noted above. There is nothing in the referenced message topic about this possibility. 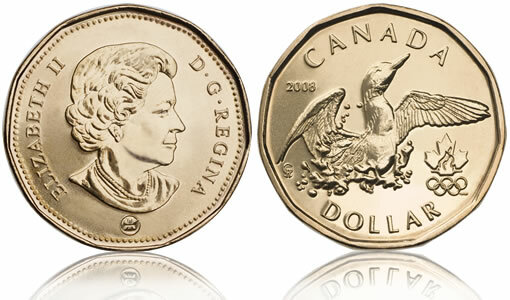 And here is a picture of what Rose is talking about, the Canadian "Loonie"